We believe the process begins with choosing the right home site. If you haven’t already chosen the perfect site, we are happy to assist you. Let us put our knowledge of the Tri Cities and surrounding areas to work for you. We will keep in mind neighborhood restrictions and amenities you wish to include. Let us get to know you. We want to understand your family needs, so we can help meet your expectations, at a price you can afford. At Rogers Development, we want you to have all the extras you expect in a home that is perfect for your family. The most important details take place before any construction begins. We are available to meet and consult with your architect/designer, or ours, to ensure every detail has been considered. This enables us to design and build a home that will meet your pre-determined budget. 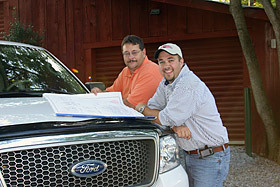 Once you have settled on a house plan we will create a detailed estimate that we can review together. We spend countless hours taking off materials and meeting with subcontractors being sure that we count for each portion of your project. Please review testimonials from happy homeowners Rogers Development has had the opportunity to work with. Or contact us for more information.